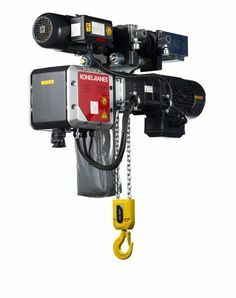 Electric chain hoists are the perfect answer for lifting or pulling a variety of heavy objects. They are most prevalent in the construction, transportation, and manufacturing industries. High quality brands and the finest of products are available new, used, or refurbished. With the help of a knowledgeable staff, you can find the best product that will handle the specific application for which it is needed. It is important to make sure that the hoist’s lifting speed, lift length, and load capacity are suitable for its tasks and that the hoist is up to industry standards and specifications. You can also check if the company offers on-site training programs for hoist operator training, rigging training, and monthly hoist inspection training. An example of a popular hoist necessary for any lifting outfit is this one, which is designed for industrial duty performance. It is compact in size and features a multiple disc motor brake, chain end stop, and an overload clutch protection device for safety and performance. CSA approved, it is rated for loads from 1/4 to five tons with 10, 15, and 20-foot standard lifts. The standard push button drop is four feet less than lift. Among other features are a compact aluminum housing for portability and easy installation, an ergonomic push button station which fits the operator’s hand comfortably for a thumb or a two-handed operation, a panel plate, limit switches which are adjustable to regulate upper and lower load travels, a five-pocket load sheave, an oil bath transmission, a chain container, and a lifetime warranty. McDal Corporation, a Coffing Hoist Distributor, carries most of the major manufacturers in the United States and provides crane sales, service, and OSHA compliant inspections in Pennsylvania, Maryland, New Jersey, Virginia, and Delaware. With over 40 years of experience and more than 100 years of combined experience in this chain hoist industry, McDal’s team of professionals sells, fabricates, installs, sells parts, and does repairs in their in-house repair facility on any hoist on the market to bring it back to factory specifications.